Drimia species have been used since ancient times for their medicinal properties. Their bulbs are considered as the main source of secondary metabolites with biological activity but the chemical composition of the other plant parts has not yet been considered. 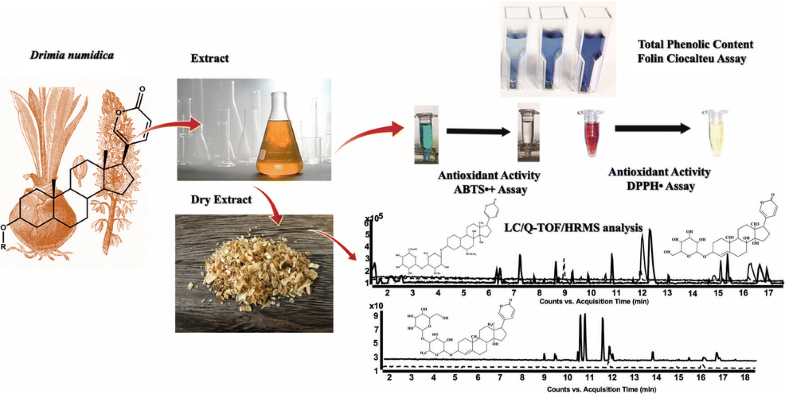 The aim of this study is to contribute to the existing knowledge with new data on the total phenolic content, the antioxidant activity and the chemical profile of different parts of Drimia numidica. 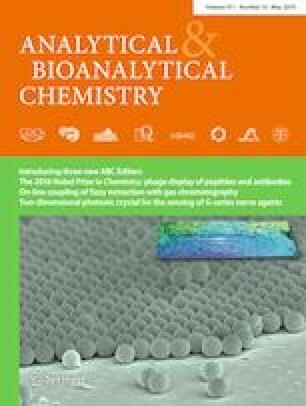 The total phenolic content was estimated by the Folin-Ciocalteu assay and the antioxidant activity with DPPH· and ABTS·+ reagents. The separation and the identification of the compounds were performed with liquid chromatography combined with time-of-flight high-resolution mass spectrometry (LC/Q-TOF/HRMS). The extract of leaves presented the highest phenolic content while the highest antioxidant activity was presented by the extract of flowers. Results of the chemical analysis verify the presence of bufadienolides and phenolic compounds. The online version of this article ( https://doi.org/10.1007/s00216-019-01781-7) contains supplementary material, which is available to authorized users. The authors want to thank Dr. Georgios Danezis for his valuable mentoring and support regarding the Folin-Ciocalteu validation experiments. This article does not contain any studies involving animals performed by any of the authors. Euro+Med (2006-): Euro+Med PlantBase - the information resource for Euro-Mediterranean plant diversity. Published on the Internet http://ww2.bgbm.org/EuroPlusMed/ [accessed 21/12/2018]. Little TA. Establishing acceptance criteria for analytical methods. BioPharm International 2016. http://www.biopharminternational.com/establishing-acceptance-criteria-analytical-methods. Accessed 20 Jan. 2019. Balogh MP. MS in practice. LC•GC Europe. 2009. http://www.chromatographyonline.com/lcgc-europe-12-01-2017. Accessed 20 Jan. 2019.